The What: ZeeVee (Stand 10-S130) has introduced a plugin module to enable Ethernet switches to integrate HDMI connectivity for video sources, including the capacity to distribute uncompressed 4K/UHD and HDR content. The What Else: Utilizing ZeeVee ZyPer4K technology in conjunction with the 96-port NETGEAR 10G M4300-96X Modular Managed Ethernet switch, the new ZeeVee module benefits integrators and end users by enabling increased options for customization, reducing cost, lowering power consumption, and simplifying installation and deployment of large IP-based video networks. 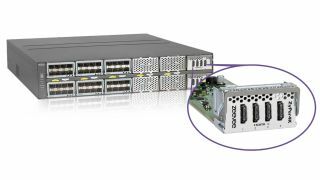 The new ZeeVee ZyPer4K HDMI Module, developed in collaboration with NETGEAR and the SDVoE Alliance, plugs into the NETGEAR switch chassis, providing a robust solution for industrial, commercial, and residential applications. Each ZeeVee module accommodates up to four HDMI sources; multiple modules may be used in the same switch. The NETGEAR switch requires just two units of rack space, presenting a compact and efficient solution to customers. As with other SDVoE components, the switch accommodates symmetric input/output configurations such as 48x48, as well as asymmetric solutions such as 10x86, 24x72, etc. The modular design of the switch allows reconfiguration of inputs and outputs should system requirements change. The Bottom Line: The ZeeVee ZyPer4K HDMI Module works natively with the NETGEAR M4300-96X Modular Managed Switch, which is preconfigured for true AV and multicast Zero Touch network configuration. It also allows designers, integrators, or users to select the combination of HDMI, copper, PoE+, and fiber M4300-96X port expansion cards that suit system requirements, connect cables from sources or decoder-equipped displays, and switch on the power. The ZyPer4K HDMI Module will be available from ZeeVee in Summer 2019. ZeeVee, an authorized NETGEAR reseller, already offers the NETGEAR M4300-96X.